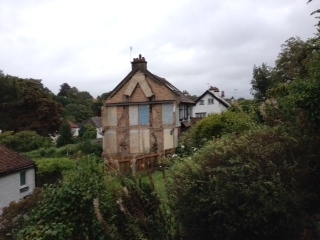 This house in Woodcote Valley Road , South Croydon was demolished following some very poor and defective building work. The neighbour’s adjacent semi detached house is still standing as can be seen . It was vital to have a Party Wall Award in place and in the absence of such , this disaster was allowed to happen . The house collapsed trapping a builder inside. Hopefully, all will be resolved soon and the property will be rebuilt. Meanwhile, significant urgent protective and remedial works are required to the neighbour’s property . If the Adjoining Owner had only engaged a firm such as ours at the outset and full Party Wall Award protection had been put in place , this probably would never have happened.